Director Dean Devlin's Geostorm is on track for a disastrous opening weekend that won't even cover the cost of the reshoots. 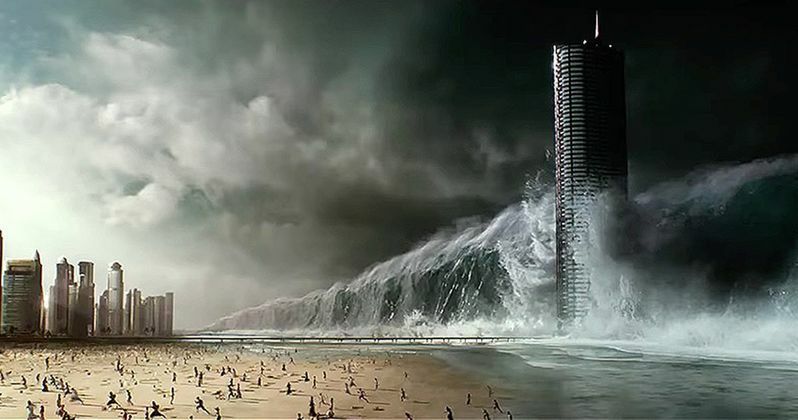 "Everyone was warned, but no one listened," says the teenage narrator of Geostorm, a natural-disaster spectacle directed and co-written by Devlin. According to the narrator, by 2019 there had been so many hurricanes, tornadoes, and heat waves that the problem of climate change could no longer be ignored. The solution? A giant weather-controlling framework that encases the Earth like a see-through geodesic dome, which is not the worst movie idea around at this current time, but probably the worst timing for a release. The movie is pretty much advertised as an excuse to blow things up like a Michael Bay movie, almost like they just gave up about half way through making the movie and decided to ditch the script and focus on the disasters and Gerard Butler trying to hack a computer. The Hollywood Reporter has revealed that Geostorm is expected to take in around $10 million dollars this weekend, which is pretty lame since the reshoots alone cost $15 million dollars. The entire budget for the disaster movie was $120 million dollars, which it won't even come close to making back in the United States. However, the movie could go on to have a life overseas. Had all gone according to plan, Geostorm would have come out way back on March 25th, 2016, under the direction of first-time director Dean Devlin. The career writer/producer is a frequent collaborator of disaster movie aficionado, Roland Emmerich, who teamed up with Devlin on hits like Stargate and the two Independence Day movies. In the wake of horrendous test screenings, Warner Bros. bumped the release date and brought on a helping hand in the form of producer Jerry Bruckheimer and Danny Cannon, but it appears that nobody could have saved this sunken ship, not even the guy who ruined the Batman franchise in the 1990s. Go figure. Many reviews for Geostorm seem to come to the same question, which is: why does the movie even exist? Which, to be fair, is quite harsh. The A.V. Club likened it to a famous Patton Oswalt comedy bit about KFC, calling Geostorm a "failure pile." In the end, it just isn't the greatest timing to have a movie about natural disasters come out right after 3 huge hurricanes devastated Puerto Rico, Texas, and Florida. But who knows? Maybe the movie will go on to rake in some serious dough overseas and be able to recoup after all. Tyler Perry's Boo 2! A Madea Halloween is expected to take the top spot this week at the box office with Happy Death Day taking in the number 2 spot. It has been a pretty dismal year for the box office as a whole, but there have been some bright spots like Andres Muschietti's big screen adaptation of IT this fall as well as Wonder Woman, Beauty and the Beast, and Guardians of the Galaxy Vol. 2 earlier this year. Geostorm and The Snowman will continue to thrive in the "it's so bad that it's awesome" category, but just not as box office sensations. You can read more about the disaster that is Geostorm via The Hollywood Reporter.